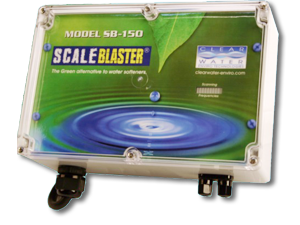 ScaleBlaster is a compact, state-of-the art, computerized system that removes scale buildup in water lines. This maintenance free, easy-to-install, product is installed on the incoming waterline of a house or building. ScaleBlaster produces an oscillating electronic field that targets, and safely dissolves, calcium molecules stuck on the walls of water lines. The result, softer feeling water on your skin, hair and clothes. ScaleBlaster is a great water softener alternative system for residential, commercial or industrial applications. Visit our ScaleBlaster webpage or contact your Export Manager to learn more about this state-of-the-art system.